Canadian Spec V-Bar is an aggressive ladder-style chain for pickups and SUVs. Each link on the cross chain that comes in contact with the road has several 'V' shaped links welded in place, working like an ice pick to give great traction, even on ice. 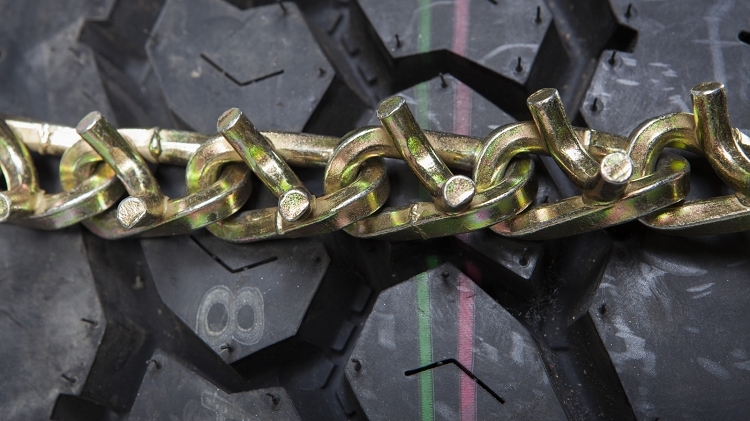 The Canadian Spec means the thickness of the chain is thicker than usual, so not for lowered trucks! Please make sure you have at least 3-fingers between the tire and any other vehicle surface (Fenders etc). This is the most aggressive and highest quality chain we sell. I think I'm the only guy in Thornhill with tire chains. I practiced putting them on in my driveway, and got some strange looks from the neighbours. Little do they know I'm heading out west in January, and carrying these chains for insurance. The seem good. I hope I won't need them though! Bought these for my 1984 F150 plow truck. This truck plows my 4 km driveway and these chains allow me to plow up several hills. The free upgrade to the alloy U grooves was excellent. I didn't think there was anything better than the V-bar but these are. Bought these chains for my 2018 off road Tacoma. Great great fit, much easier to install compared to cables... absolutely love the cambers and the additional elastic, nothing moves at all. Hade purchased for my winter tire that are nokian lt2 245-75-16 and the also fit the original tire size that are 265-70-16 which are an overall same size. I hilly recommend this product. Great product. easy to use. fits well. Fast shipping. Will always recommend! These chains have worked awesome so far. Tried them out as soon as I picked them up on a hay run for the horses. Had to climb and very long and steep hill full of switch backs with a heavy load. They got me out and my truck didn't even feel like it was working hard and it does even on summer roads going up that hill. Love these chains and regret not having them sooner. After sizing my chains to fit my application, I am pleased with the quality of these chains. Several cam locks to take up slack and simple to install using the supplied tensioning tool. They are now in the back of my truck in case I ever need them. Like the Boy Scout motto:'Be Prepared'! 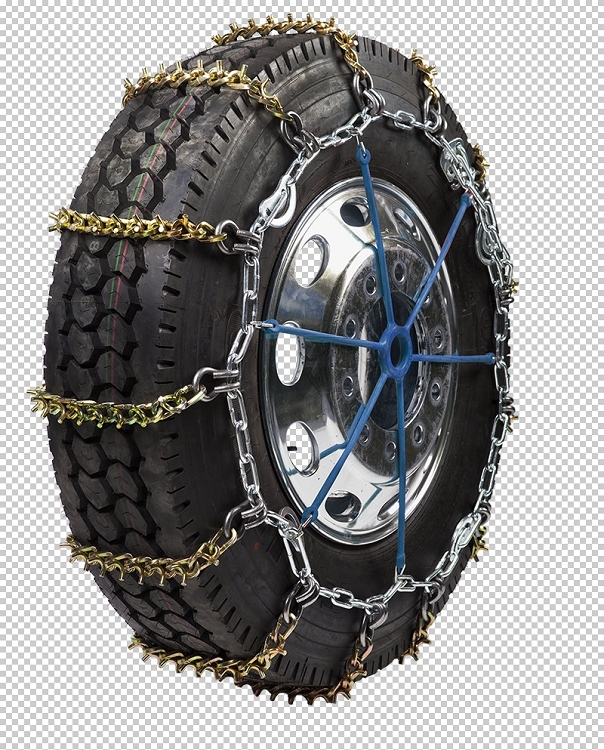 I ordered these tire chains on line. Shipping was super quick. 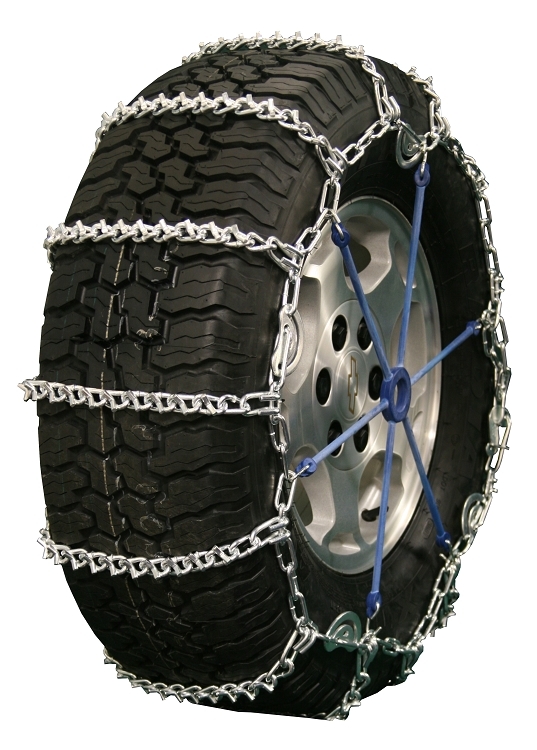 These tire chains are top quality and they very easy to install and adjust. I ordered these for my 06 Dodge Cummins and I am sure my old Dodge could climb a brick wall with these chains on!! If you live in snow country do yourselves a big solid and get these chains. These chains are my insurance policy and ever since I started using V-Bar Chains I have never gotten stuck in snow, mud or ice. But lest start at the beginning. This is my third set of V-Bar Chains (new truck differed tiers hence new V-Bar Chains). This is the first time I purchased the V-Bar Chains from "Canadian Chains". The service from “Canadian Chains” is first class, quick response on my e-mail request and a very fast delivery of the V-Bar Chains and included were a couple free gifts. Thanks. I inspected my new V-Bar Chains from Canadian Chains and fitted them on my truck, the V-Bar chains are fitting well and appear of superior quality over the previous two sets I owned. At this point I have not used the new V-Bar Chains on or off the road and hopefully I never will, but I know from past experiences that if I ever will need chains that I have purchased the best chains money can buy! Purchased these chains for my 2013 Dodge Ram to use when plowing snow. I was surprised how easy they are to install. They have made a huge difference. Much easier on the truck with the tires dgging in. Received the chains last week. Thought winter was over and I would not need them. However, an ice storm combined with 8" of snow changed that. Put the chains on the truck. They went on easy and quickly. unlike an old pair of chains I had. I also bought the spider adjuster. I highly recommend them. Oddly, the chains also fit my rubber tire bobcat. I'm pleased with their performance and quality. These chains are exactly as described - high quality and made from heavier chain. They are precisely what I wanted and fit perfectly. I've had multiple chains in the past but never with the adjustment cams which work great. The spider bungees are probably not even necessary but at $15/pair are cheap insurance. I recall my father having a similar set of V-bar chains in the fifties, on his Chev coupe. Roads were not always plowed in the area, and those chains took us to all Christmas family meetings at the end of side road # 2. When I saw that same type of chains on my neighbour's pick-up with a plow, he told me it came from CanadianChains. Ordering was easy, and delivery right on time for the next snow storm. Those chains have a very firm grip on icy surfaces, so much so that you have to watch for not digging into the pavement underneath. The spider tie downs are amazing in terms of keeping the chains tight on the tires. A best buy anytime. This is the second set of these truck chains.. You will not be disappointed with how well they work. You get what you pay for..!!!!! Hey I recently purchased a full set of these v bar tire chains. Wish I could say I’ve had to use them but getting ready to leave for a ten day snowboard trip and haven’t put them on the truck yet. I did however put them in a spare set of truck tires I have and they fit perfect! Install was easy and the spider bungees seem to take up any little bit of slack that was left. My trucker buddy came over and he said they were great quality chains with all the cam adjusters around the outside so I was pretty happy about that as well. I’ll write another review when I have a chance to go recover my ice fishing camper that I had to leave on Lake of the Woods when the weather was too bad a few weekends ago. Extremely fast shipping. Product is very good quality. Excellent value for the money. I strongly recommend. Excellent service and response to questions. Haven't had the opportunity to try the chains out yet, however they product appears to be well made and good quality materials. The chains are heavy duty and good quality. I have not tried them on yet but watched the video and they look like easy to put on your tires.